Now that the Canada Line exists, I don’t take the Cambie bus very often. Generally, it’s only if I want to shop in the Cambie village, as there’s no convenient skytrain stop there (aside: Why on earth there’s no stop at either 16th or 17th is beyond me – it seems to me that the village suffered hugely during construction, but gets almost no benefit now that it is re-opened, because there’s no nearby stop. I suspect most increased business is due to how much easier it is to get there by car & bike, rather than transit). The Chaos at the south side of Cambie Bridge. Currently, there’s a Northbound stop at W. 7th ave, outside the Save On Foods – this is great! 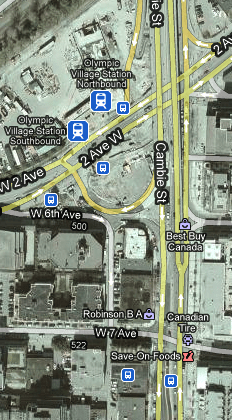 But then, the bus has to change lanes to get on to the Cambie Bridge. Once on the bridge, the bus has to change langes again, back to the curb lane, and the next stop is not until the north side of the bridge, at Pacific Blvd. It eliminates 2 lane changes on a busy street – a sure way to reduce the chance of accident. With a bus stop at W. 6th, it makes it really easy to transfer to the Canada Line at the Olympic Village station. It creates a new transfer point for both the eastbound & westbound 84 bus line & additional transfer point for the 50 bus. As the south side of False Creek grows, having a stop here becomes increasingly useful place for people to hop on transit to get to the Library, SFU Downtown & even gastown, as the bus passes by it at Cambie & Pender streets – a route not well served by the Canada Line. For (lazy) bike riders, it’s a nice place to get put your bike on the bus at the bottom of the hill to ride up to Queen Elizabeth, the Cambie Village, etc. after coming over the bridge, or along the seawall, or along 5th ave, etc. I see one potentially large downside, which is that the bus has to go through an additional traffic light, which could add some time to the overall route. My personal feeling is the upside to this outweighs this issue. Quite rightly, VANOC is suggesting that people use transit during the Olympics to get around. This is a good & Noble goal. However, I have some concerns, particularly around use of the Canada Line. At the best of times, my experience is that tourists find our lack of transit gates to be confusing. It’s not terribly clear how to buy tickets, how to “activate” (or whatever the proper term is) them, and how long they’re useful for. This all seems clear enough to residents (although due to the supposed level of fare evasion, maybe it isn’t), however I’ve on at least a dozen of occasions helped tourists figure out how to use the Skytrain (buses are not an issue, due to there being a driver to manage this). About once a week, at Oakridge Skytrain station, there is a Canada Line attendant who stops and asks to see people’s tickets. This inevitably causes a slow down in getting on the train, and clearly, by the look on people’s faces, is annoying. Given how incredibly packed the Canada Line is already, I can just imagine the confusion & anger if Translink tries to do this during the Olympics. And, as I imagine Translink is looking at the Olympics as a golden opportunity to make some much-needed revenue, I’m expecting to see a veritable army of green-jacketed people checking for tickets. As a result, I’m imagining an even larger army of angry, confused & frustrated people trying to get on over-crowded trains to get downtown to venues, hotels, events and the whole thing just ending up with Translink having a black eye. I hope that this doesn’t turn out to be the case, but given how poorly thought out the Canada Line constructions appears to have been, I am quite worried that it will end up being a fiasco. Does anyone remember the insanity of the opening day of Canada Line? Imagine that for 2 weeks now. Only it’s tourists stuck in the huge lines, who are perfectly willing to complain to all the media who I’m sure will rush to cover it, rather than us locals, who are more likely to put up with it. It may be easier for all involved to either a) simply allow free travel on the Canada Line (or all skytrain lines) during the Olympics (highly unlikely at this point) b) provide each and every visitor who has an even ticket a commemorative transit pass (also unlikely) or c) have the Canada Line staff at the stations to help buy tickets, etc, but don’t sweat any accidental (or on-purpose) fare evasion during the Olympics to make using the service as nice as possible for all involved (also unlikely, but seems to be the lease unlikely).